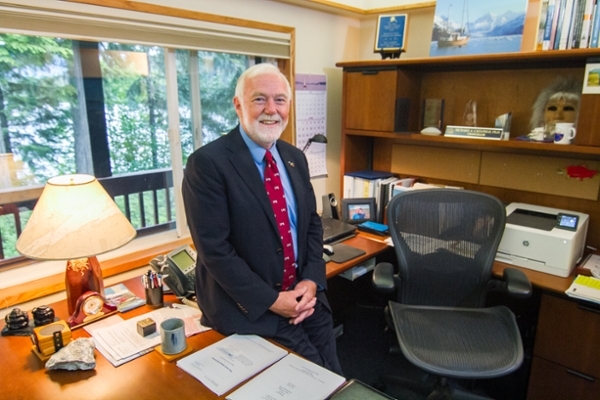 Dr. Richard Caulfield serves as Chancellor at the University of Alaska Southeast (UAS), located in Juneau, Alaska’s capital city. UAS is a regional university with campuses in Juneau, Ketchikan, and Sitka—coastal communities situated in Alaska’s magnificent Tongass National Forest. As Chancellor, Caulfield provides strategic leadership in fulfilling UAS’ mission, including budget development, academic planning and program assessments, student and enrollment services, administrative services, and community relations. Previously he served as UAS Provost. In that capacity he was responsible for ensuring that UAS academic programs meet regional and professional accreditation standards and fulfill the university’s mission and core themes. Within the University of Alaska Statewide system he has been a leader in advancing innovations in teacher education, Arctic social sciences, higher education leadership, Alaska Native and minority student education, and online programs. Caulfield’s extensive university experience began when he served as an instructor in Alaska’s Bristol Bay Campus, part of the University of Alaska Fairbanks (UAF). His career includes teaching, research, and service that led to tenure and promotion to the rank of full professor at UAF. He served as a department chair, academic program leader, campus director and dean. He took the position of UAS Provost in 2010. In this capacity he was responsible for ensuring that UAS is fully compliant with NWCCU standards and that regular program assessments and reviews are completed successfully. As Provost he chaired the Provost’s Council, co-chaired the UAS Strategic Planning and Budget Advisory Committee, and served on the UAS Campus Master Plan Implementation Committee. He has been a leader in university/community planning efforts involving political leaders, industry and business leaders, service organizations, Alaska Native/Native American entities, and government agencies. Caulfield has served on national and international academic boards, including the Executive Committee for the University of the Arctic, the International Arctic Social Sciences Executive Committee, and the Oceans/Atmosphere/Ice Interactions Science Steering Committee for the National Science Foundation. He served as Alaska’s representative on the Executive Committee of the Western Academic Leadership Forum, part of WICHE (Western Interstate Commission for Higher Education). He has a solid track record of building relationships leading to private philanthropic giving and industry investments. In his capacity as a community campus director he served on regional and statewide workforce development committees, including on the board of the Alaska Process Industries Career Consortium. Caulfield earned his PhD in the United Kingdom in 1994 based upon research about aboriginal subsistence whaling in Greenland (Kalaallit Nunaat) and the Arctic. His Greenland research, supported by the National Science Foundation and the Sir Phillip Reckitt Foundation, led to publication of two books: Greenlanders, Whales and Whaling (University Press of New England) and Inuit, Whaling, and Sustainability (co-author/Alta Mira Press). He earned a Master’s degree in Education from the University of Alaska Fairbanks (UAF), and BA and BS degrees with Honors in Political Science and Natural Resources from the University of California, Berkeley. He speaks Danish and Kalaallisut, the Greenlandic Inuit language. He is the recipient of the University of Alaska’s Dennis Demmert Award for excellence in serving Alaska Native Students. Rick and his wife Annie have three grown children and one grandchild. He is active in Southeast Alaska community affairs, serving on boards and committees with the Juneau Economic Development Council and the Juneau World Affairs Council.